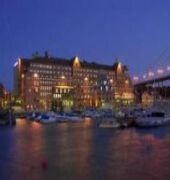 The Novotel Goteborg is 4 star hotel located at the entrance to Gothenburg Harbour. Ideal for a business trip with meeting rooms and WiFi internet, the hotel is also perfect for a holiday or short break in this vibrant maritime city. With its own restaurant, bar, sauna, terrace and onsite car park, the Novotel is an excellent base to discover the great food, culture and entertainment on offer in Gothenburg.